Starting with different types of guitars available and the different styles of playing you are introduced to: Open chord shapes for major, minor, seventh, sixth, major seventh, suspended, diminished and augmented chords. Learn to play over 50 chord progressions, including 12-bar blues and turnaround progressions. 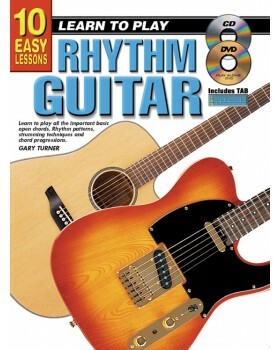 Learn to play basic rhythm patterns using easy read rhythm notation. No prior knowledge of music or playing the guitar is required.